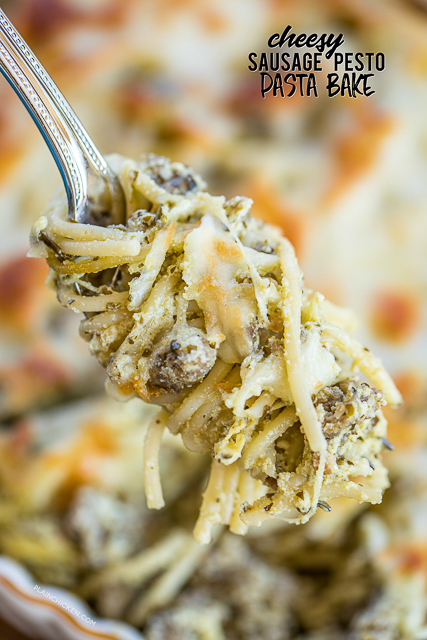 This Cheesy Sausage Pesto Pasta Bake is loaded with all our favorites. Italian sausage, pesto, pasta and three different cheeses. Seriously delicious. 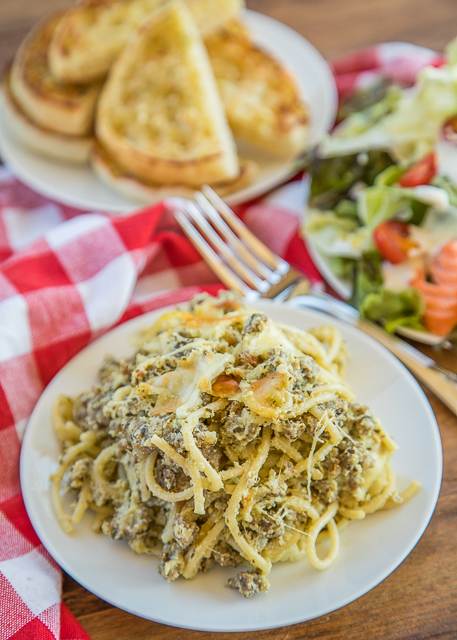 All you need is a salad and some garlic bread, and dinner is served! 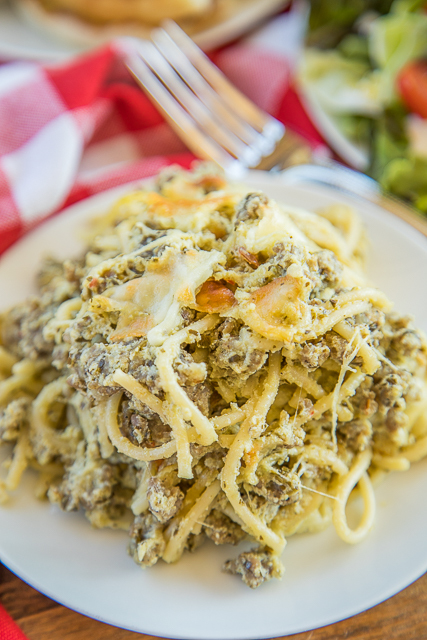 If you want to put a “healthy” spin on this Cheesy Sausage Pesto Pasta Bake try using whole wheat pasta instead of regular pasta. You can also use low-fat ricotta cheese and turkey sausage. All three are easy swaps that don’t sacrifice any flavor. 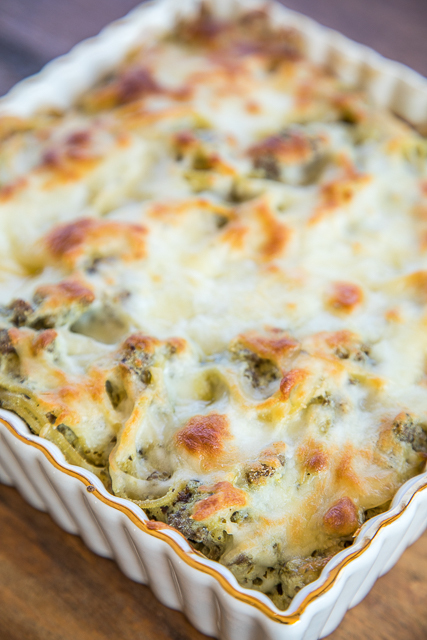 This Cheesy Sausage Pesto Pasta Bake can be made ahead of time and refrigerated or frozen for later. YAY to easy weeknight dinners! Preheat oven to 400ºF. Lightly spray a 9x9-inch pan with cooking spray. Cook sausage in a skillet over medium-high heat until crumbled and no longer pink. Drain fat. Cook spaghetti for 2 minutes less than the package directions specify. Drain the spaghetti well. Place cooked pasta in bowl. 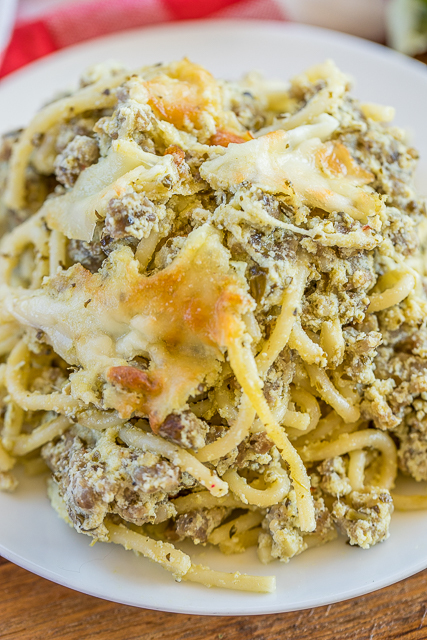 Stir in sausage, ricotta, pesto, 1/2 cup mozzarella and 1/4 cup of the parmesan cheese. Toss the mixture well and transfer it to prepared pan. Bake, uncovered, for 25 to 30 minutes. I am drooling! I can't wait to make this. Thank you so much.